I don’t wear a lot of makeup. I just don’t have the patience for it. However, I can alphabetize 200 CD’s no matter how long it takes. I guess we are all built differently! I do appreciate seeing my friends who know how to apply a perfect amount of makeup and still look natural. Don’t you hate it when you look amazing in your bathroom mirror and then you get in the car and you look like Bozo in the car mirror? What is it with the car mirror?! Or is it the bathroom mirror?! Who is the real culprit? Like I said, I don’t always put on a full face of makeup but I like having the right tools when I do. I like to see my makeup. 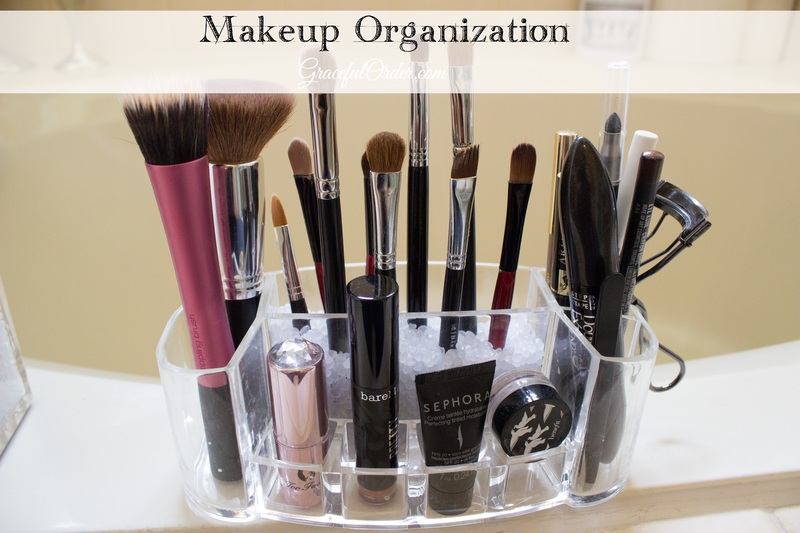 I purchased this large acrylic organizer at Target about five years ago. They still have it in the section where they have all the cosmetic bags. I place all the single shadows here so that I can see all the colors without shuffling through a bag. In the large vertical spaces I store lip glosses and eye pencils. I like that I can see them all at a quick glance. 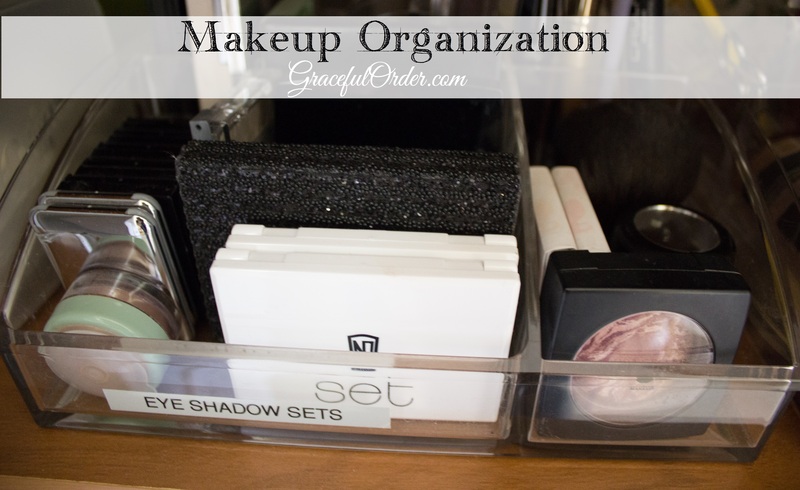 The eye shadow sets are stored together and vertically. It makes it easier to pull them out, use them and put them back in their spot. Foundations and primers have their own zip code as well. I picked up that little clear container at the Target dollar section. Sometimes I cant find anything in that little section and sometimes its full of gems. Lastly, the brushes. I love those beads that they use at the top cosmetic stores so I decided to house my brushes in a similar way. It turns out they sell those beads in most craft stores. I used an acrylic pencil cup to contain the larger brushes. The smaller brushes along with other makeup essentials are in this slim container. I also used the beads in the larger compartment. So ladies, let’s put on a little rouge, a little color on our face and go out into the world (or in my case, WalMart) with confidence. I love those containers! They look very functional. 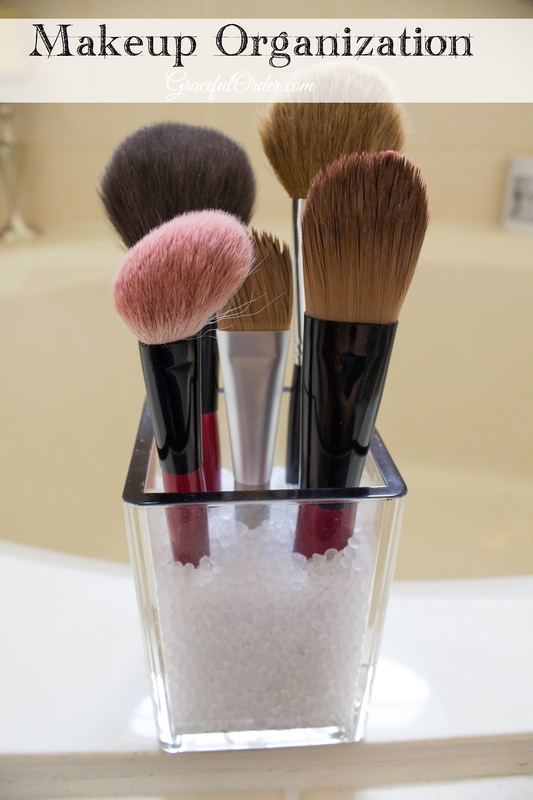 One question: do you keep the above containers on your bathroom counters? Would love to see a photo of all of them together. I also loved the part about the mirrors…I always wondered that too! Thank you! I can’t keep the containers on my counters since they are so small. I do have some slim shelves on the wall (next to the sink) where I put my brushes and my skincare items. 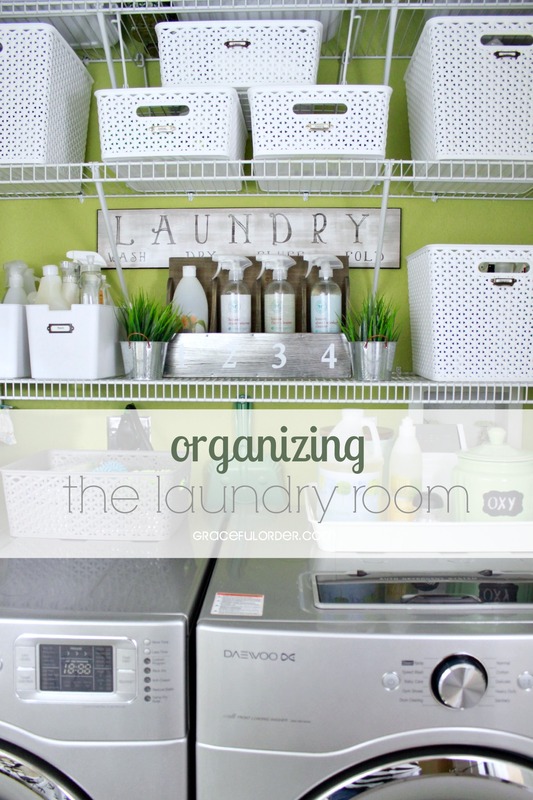 If you have a chance check out the post on the bathroom linen closet so that you can see size of the space ( http://gracefulorder.com/2013/07/15/bathroom-linen-closet-organization/ ). I will be doing a post on the shelves on the wall soon. Stay tuned. Yes! Love the original beauty box. Expensive but it fits so much! I will check out your blog. Thanks! 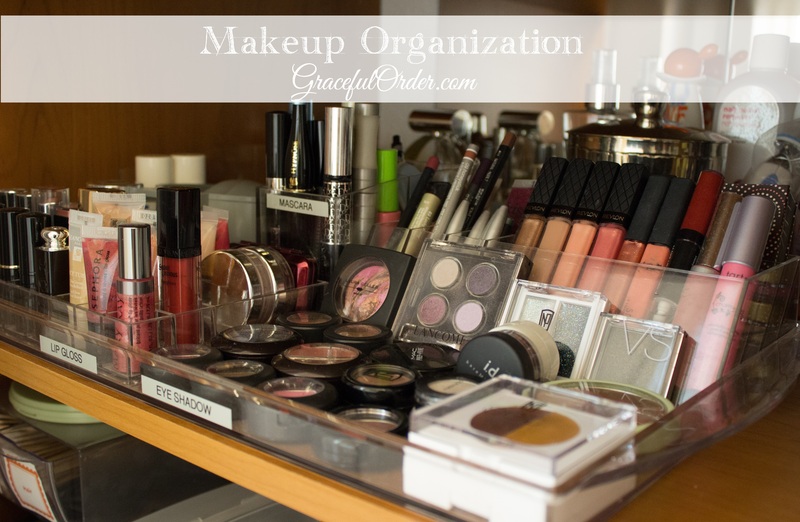 I love make-up and I have a nice assortment of it. Where did you get the beads for the brush cup? 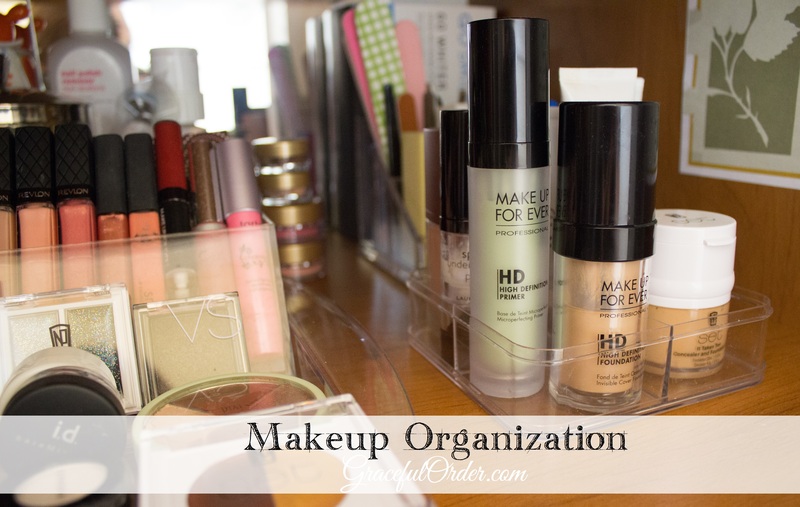 Love the organization idea. I have a walk in closet with a pretty big counter that can accommodate the bins nicely….I can see it now….even a mirror at the center…oh my…what are you turning me into. Thank you for this. Very helpful! Glad you are getting inspired! I purchased the beads on amazon ( http://www.amazon.com/Darice-Bean-Filler-Plastic-Pellets-16/dp/B001O5SQCO/ref=cm_cr_pr_product_top ) but I think that you can get them at Walmart and other craft stores for less money. I came here from YHL forums… I love organising and you have so many great ideas. Sorting out my makeup is one of my goals for August, so you’ve really got me thinking! 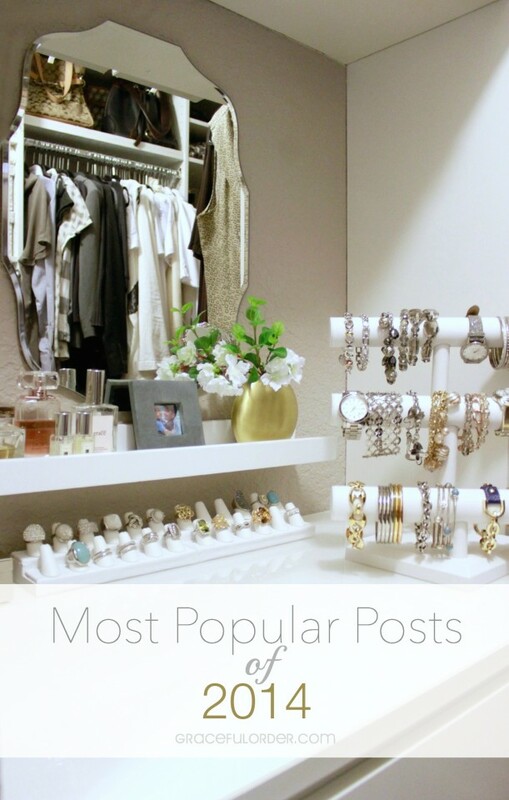 Thank you so much and you can now follow me on bloglovin! I just set it up. 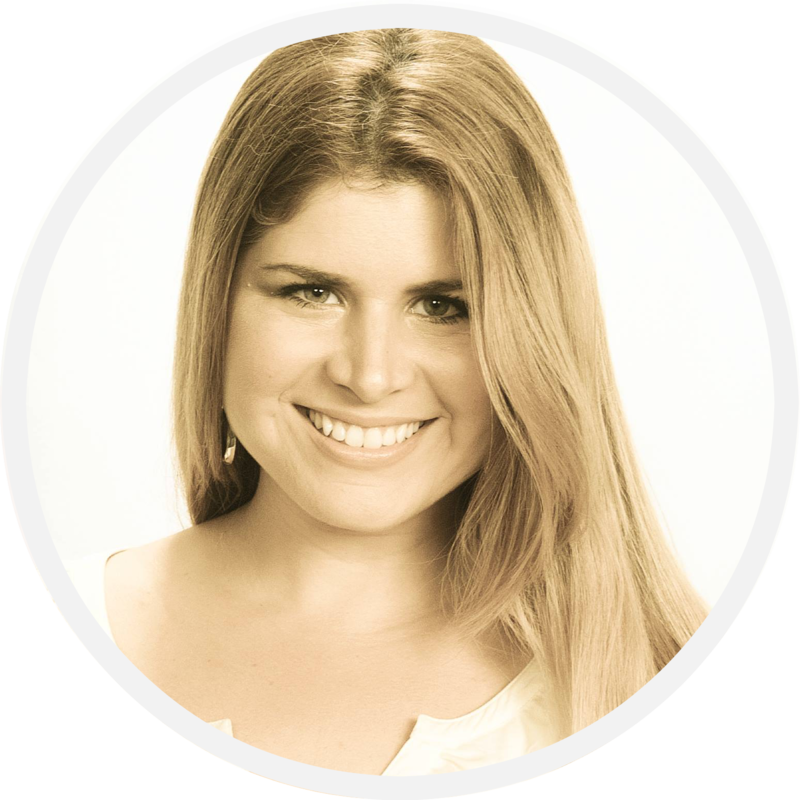 Hi Maria, Love your site! Sweetie you said you don’t alot of makeup – understatement! Girl I thought I was going to me able to order online haha. 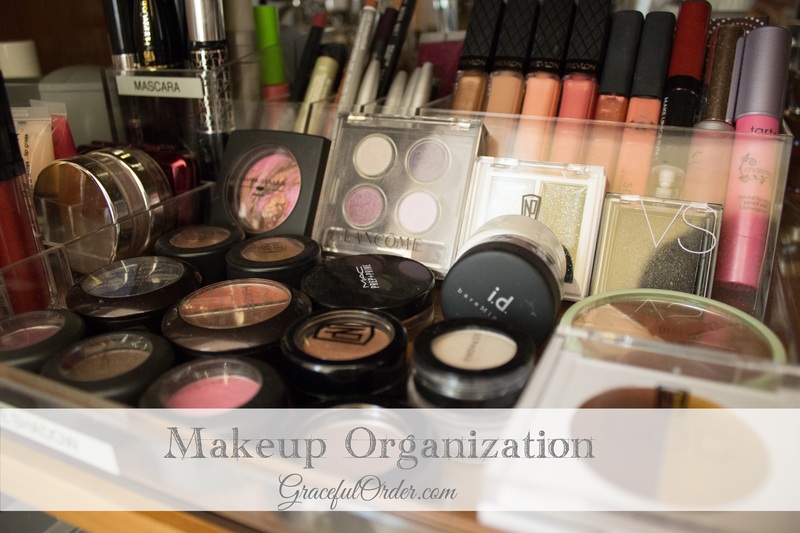 Just joking but thanks for the tips, any suggestions for those of us that don;t have alot of makeup just enough for a makeup bag. Maybe how to keep it in order to keep it from overflowing. Blessings! Blessings to you Angie! Thanks for stopping by!